Get Involved > Sign Up to Volunteer! Signup page should look like this! Contact Hauli Sabatka, Executive Director for Advancement, at (402) 462-6566 or email hcssignup@cdolinc.net if you have questions or need assistance with the signup process. Since 1912, the primary apostolate of the Catholic parishes in Hastings, Nebraska has been to provide Catholic schools for the youth of the community. Each generation has embraced this work with dedication and sacrifice, recognizing that Catholic schools are the best means of sharing the faith with children and preparing them for service to the Church and the community. During his visit to Our Lady Queen of Angels Catholic School in New York City in 2015, Pope Francis addressed the New York City children with these words: How nice it is to feel that school is a second home.This is not only important for you, but also for your families. School then ends up being one big family.One where, together with our mothers and fathers, our grandparents, our teachers and friends, we learn to help one another, to share our good qualities, to give the best of ourselves, to work as a team and to pursue our dreams. Our Holy Fathers words express the hope and possibility we are pursuing with an organized program: we dream of our children, formed in faith, knowledge and service, ready to take their place in our community and Church. We model and achieve this dream by sharing the gift of ourselves through active participation in school activities. This effort creates the family community we seek, offers participation to everyone, builds friendships and creates the environment that is the hallmark of Catholic schools: together we form our children in the Lord. Research from 2015-2016 School Year: Our participation enhances the financial support of Catholic parishioners, parents, and community donors. Revenues generated and costs saved by working at activities amounts to about 11% of the schools annual budget. The chart below outlines the typical revenues generated by these efforts. These efforts directly reduce the assessment of tuition and fees for a childs education in Hastings Catholic Schools. Family participation is understood as a necessary and integral component of the financial management of the school and of a familys share in the gift of Catholic education received from the Church and the Hastings community. The familys donation of time for the good of the school community is critical to the Catholic education of each familys children. The following policy details the guidelines for activity worker requirements at Hastings Catholic Schools. The School Fundraising Opportunities generate funds that go directly into the Hastings Catholic Schools annual budget. Without these fundraising opportunities, the tuition rates would need to be increased by approximately $750 per student. The majority of these events have been uploaded to our volunteer software program SignUpGenius for families to sign up. Each family is responsible for a minimum of four (4) shifts and at least one (1) needs to be a bazaar or chicken noodle dinner shift and one (1) needs to be a concession stand, gate or fairgrounds shift. You and your family are not limited to 4 shifts, you are encouraged to be active in as many events as you would like. 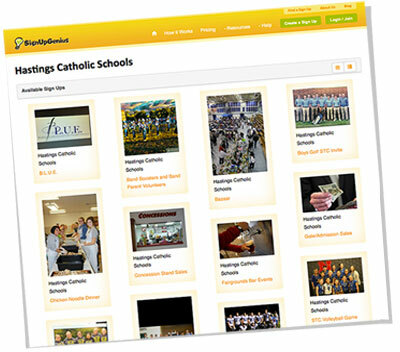 The full schedule of all opportunities can be found at www.hastingscatholicschools.org/signup. The STC High School students will also be participating in the Family Participation Plan. Each high school class is assigned a number of games that they will provide three (3) class members to assist with concessions alongside the adult volunteers. The STC Student Council and Class Representatives will be responsible for working with their respective class to fill their assignments. Parents of these student will be notified when their child signs-up. When selecting times, please be conscious of your student(s) activities as well. We want everyone to have the opportunity to watch their child participate. Families will have until Monday, September 10 to sign up for their shifts online. The school administration will start contacting families who have not signed-up to work together to find them shifts that fit their schedule on Wednesday, September 12. Families are required to cover their shifts. If you are unable to cover your shift, YOU are responsible for finding a replacement. You can swap your shift on SignUpGenius with your replacement at www.hastingscatholicschool.org/signup. After arranging your replacement, please contact the Advancement Office at 402-462-6566 or hauli-sabatka@cdolinc.net with this information. They will update the Master Schedule. SignUpGenius will email reminders to those volunteers listed for the upcoming activities and the school will make reminder calls, emails and text messages. Many families will be asked to assist at additional activities throughout the year. We ask that you prayerfully continue to assist the school with these activities whenever possible. The School Hosted Activities are essential for our school to host athletic events. The behind the scenes efforts are often taken for granted, but they play a very valuable role for our school. These workers not only aid in helping these athletic events function efficiently, but also save the school money by not having to hire others to perform these tasks. Assisting with these activities will count as credit towards the shifts required mentioned above. The School Betterment Opportunities do not directly impact the financial status of the school, but are essential for its operation and contribute to our schools culture. The Unity Board is a joint leadership team consisting of school community representatives and the school and Parish (STC & STM) Clergy and Administrators. The Unity Board and Committees looks at the schools Finances, Facilities, Faith, Enrollment and Marketing, as well as the overall school experience. The Board also assists the Chief Administrative Officer of the schools in his duties by providing advice and by serving as a communication link between the Administration and the school community. The Home School Association (HSA) is part of the St. Michaels Elementary School Parent and Teacher network. The HSA provides support to teachers and strengthens the schools culture. The Alumni Board works with the Advancement Office to create a lifelong and worldwide community of alumni through increased opportunities for meaningful engagement in order to increase awareness, pride, participation, volunteer involvement, and philanthropic commitment to Hastings Catholic Schools. Hastings Catholic Activities Association (HCAA) Activities works with the Athletic Director to support the Hastings Catholic School by promoting excellence in activities by developing a coordinated effort among various programs. They develop enthusiastic support among students, parents, players, participants and the community of the Hastings Catholic Schools through fundraising efforts. It is strongly encouraged for each family to engage in these School Betterment Opportunities to further strengthen our school system for these and all future students. Hastings Catholic Schools affords students the opportunities to participate in various extra-curricular activities. Several of these activity groups have various fundraising opportunities that directly benefit those students involved in specific activities. The parents of the students involved in these activities are encouraged to assist with these events so their children see the benefit of the funds generated. It is important for Hastings Catholic School families to be involved and stay involved in their Parish. St. Michaels and St. Cecilias Parishes provide extensive support to the school in many ways. These two Parishes currently provide approximately 50% of the funds needed to operate the school and educate the students. They also provide spiritual support and are the cornerstone for our Catholic Community in Hastings. Families are strongly encouraged to give of their time and talents at their parish and contribute to the parish community. Please contact your parish for more details on parish stewardship. Each school family shall be responsible for working in the activity outlined earlier. The school will manage the activity database and schedule and will track family participation on the SignUpGenius software at www.hastingscatholicschools.org/signup. The school will document the attendance for the required events and this will be reported to the school administration. If you have any questions, comments or ideas, please contact us at 402-462-6566 or hauli-sabatka@cdolinc.net. Once again, the school relies heavily on the work of their families and supporters. Many that assist are parishioners or community members that do not have a child in the school system. The school would like to extend a sincere Thank You to all those who have and will assist to benefit the students at Hastings Catholic Schools. We ask that you also thank those that work and participate alongside you. Do I/we have to set up a SignUpGenius account to participate? No, you can just sign up for the activities you would like to help HCS with and press submit. 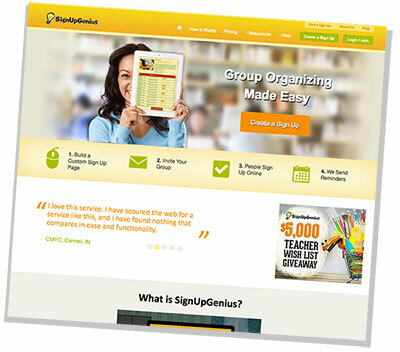 If you want to be a SignUpGenius pro you can make an account and spend hours on this great site! We are all busy, we vote for the simple sign up with no password! I am not sure if I am at the right spot on SignUpGenius? I signed up for a shift and now I have a conflict. What do I do since I cant make my shift? We totally understand! We anticipate that this will happen with scheduling. If the shift is more than 2 weeks away, go back to the area that you signed up for (for example the Concessions event box.) At the top you will see Already signed up? You can change your sign up. Click this link and you can change. We do ask that you limit these changes especially as the shift draws near. If it is within 2 weeks of your shift, we ask that you try to find your own adult substitute for your shift. We would love for you to let us know about the substitute change especially if it is within 2 weeks of your scheduled shift. Please let us know at 402-462-6566 or hauli-sabatka@cdolinc.net. We dont want to miss any changes and will do our best to work with you. What if all the slots are filled? Hold on - we need to do a few cartwheels! Yipppee! Did you really say all the slots are filled? In all seriousness, if all the slots are full, we ask that you contact us and we will work with you on finding an area that may still need additional help. We will work with you to make it happen! Please contact us at 402-462-6566 or hauli-sabatka@cdolinc.net. What happens if I dont sign up for my shifts by Monday, September 10? We would love for everyone to sign up for their minimum of 4 (academic year) shifts by the end of the day on Monday, September 10. On Wednesday, September 12, the school administration will start contacting families who have not signed-up to work together to find them shifts that fit their schedule. Families are required to cover their shifts. If needed, shifts will be assigned and we will notify you of those shifts. If there are serious concerns or conflicts, please dont stress. Please contact us at 402-462-6566 or hauli-sabatka@cdolinc.net and we will help. I spend a lot of time volunteering for things not listed as an option on this site, can all those hours count? Thank you for all the time, talents and treasures you give HCS! We could not survive without you and others like you. Honestly, we had to start somewhere. If the area in which you volunteer is not listed, we ask that you contact us. We will work with you to get this added or make sure these hours are tracked. Our committee anticipates areas that are forgotten and we understand this new program will take some time to work out all the details. Contact us at the HCS Advancement Office at 402-462-6566 or hauli-sabatka@cdolinc.net and we will work with you. (Some hours will not be counted toward your 4 (academic year) shifts (example: Band Boosters, since their hours produces $$ towards their students band account.) Only the School Fundraising and School Hosted Activity Opportunities from the Family Participation Plan currently count towards the required 4 shifts in the academic year and the 1 summer shift. If my husband and I both work the same shift, does that count for 1 or 2 shifts? If you and your husband signed up for different slots for the same event, that counts for 2 shifts of the family minimum of 4 shifts in the academic year and 1 summer shift. However, you had a great time right? It's almost like an HCS date night? Almost? Are you sure you dont want to sign up again together next month? We would love that! Why are the STC High School Students working concessions this year? Taking the lead from the peer schools we researched, we were the only school not using our STC High School Students in our concession stand. We are working with the Student Council and Class Officers to have at least two (2) STC High School Students at each of our concession events. We have even assigned the Middle School Students a few of the busy varsity games to give the High School Students a break. We are putting the responsibility on the Student Council and Class Officers to organize their class assignments with their sponsor. Dont worry, if your child signs up, you will notified as the parent of their responsibility. If my student volunteers, does that count toward our family minimum of 4 shifts (4 for the academic year, 1 for summer)? Since starting in the fall of 2015, we are only counting the shifts that an ADULT works towards your family minimum shifts. This may change in the years to come, but we had to start somewhere. However, the hours that your student works will count toward the volunteer hours of service learning our STC students are required to have. Last year I worked at least 10 concession events myself? Does my family really only have to do a minimum of 4 shifts this academic year? Thank you for your dedication to HCS. You are exactly why we felt the need to research our peer schools in order to develop this Family Participation Plan. No family should have to do all the work. We would love for your family to select more than 4 shifts during the academic year or more than 1 shift this summer, and honestly, we may need some families to still do 10. But if we all work together, we should be able to make this a fun and manageable way to participate together as a school community. If you would like to do more, please sign-up or contact us and we will let you know the areas that need the most help! Call the Hauli or Jackie at the HCS Nevrivy Center at 402-462-6566 or hauli-sabatka@cdolinc.net. You can also stop by our office at 604 North St. Joseph Ave, across from the middle school entrance. We usually have a full candy bowl - stop in! I dont have access to a computer or email what do I do? Call the Hauli or Jackie at the HCS Nevrivy Center at 402-462-6566 or hauli-sabatka@cdolinc.net. You can also stop by our office at 604 North St. Joseph Ave, across from the middle school entrance. We are willing to work with families one-on-one to make this work in their schedules. You can also talk with Mrs. Rasmussen or Mrs. VanCura, principals at STM or STC about this process. Honestly, this gets me a little upset. I pay tuition, why do we need to sign up for a minimum number of shifts? We understand. In fact we discussed this exact topic many times in our meetings. Our detailed research outlines (2015-2016) that the cost per student was $7,050 with an average family payment of $1,200/child. The St. Cecilia and St. Michael Parishes contribute $3,430/child, HCS Annual Appeal fundraising drive contributes $970/child, HCS Endowment contributions of $510/child and finally these special events (that are in need of shift help for) contribute $750/child. We need help as a HCS community to support these events. We researched many of our peer schools and found that they have been doing this for years within their school communities. For years, we have been working with many parent volunteers to fill these shifts, but we needed a plan to get everyone involved. To grow, we needed to take a step in this direction in order to provide the best education for our children without having tuition raise significantly. Contact us, we would love to talk and hear your thoughts and ideas on how we can move forward together. Will there be someone to show me what to do when I arrive to volunteer for my shift? Yes, each shift will have a LEAD or CHAIR or someone who will be there to show/train all volunteers on what they need to do. I want to get more involved! How do I become a LEAD or CHAIR? We love you! Seriously, we do! We have all heard the African Proverb, It takes a village to raise a child. We agree, it takes us all working together to raise ALL our children in Gods eyes. We are in need of time, talents and treasures on all levels. We would love to talk to you about what area you are excited about and help you become LEAD/CHAIR and use your time and talents for our children to grow. Thank you! Do STM elementary families need to sign up or just STC high school families? Yes, we are asking all STM and all STC families to sign up for a minimum of four (4) shifts for the academic year and one (1) shift for the summer. We are all ONE community of Hastings Catholic Schools. In order to grow together, we must work together. Pope Francis said, Dear brothers and sisters, the Church LOVES you! Be an active presence in the community, as living cells, as living stones. We are one Hastings Catholic Schools community working together to grow our children in HIS grace. How can I get a sign up form made for the school project I need volunteers for? Great idea! Contact the Advancement Office and we can help! This is all so overwhelming! I dont understand. Can someone help me? We have coffee! We can help! Call, email, or stop in! Call the Hauli or Jackie at the HCS Nevrivy Center at 402-462-6566 or hauli-sabatka@cdolinc.net. You can also stop by our office at 604 North St. Joseph Ave, across from the middle school entrance.